Homepage for Introduction to Anthropology 2017, taught by Jason Antrosio at Hartwick College. The one required textbook for Anthropology 2017 was the 3rd edition of Anthropology: What Does it Mean to be Human? by Lavenda and Schultz. This Anthropology 2017 course was the last time that I used the 3rd edition of Lavenda and Schultz. 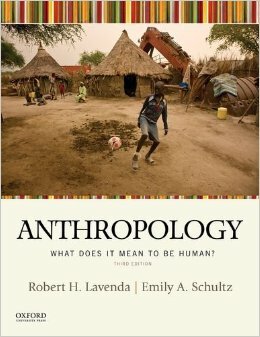 For my 2018 introduction to anthropology course I used the 4th edition of Lavenda and Schultz. See Anthropology 2018 for a course outline. Also see Intro to Anthro 2018 for a course outline based on Anthropology: Asking Questions about Human Origins, Diversity, and Culture by Welsch, Vivanco, and Fuentes. Why Does Globalization Feel New? Yolanda Moses, “Why Do We Keep Using the Word ‘Caucasian’?” Sapiens, 2017. 9. L&S chapter 6, “How Do We Know about the Human Past?” (163-192). “New Women of the Ice Age” by Heather Pringle in Discover (1998). “The Worst Mistake in the History of the Human Race” by Jared Diamond in Discover (1999). 12. Lavenda & Schultz chapter 8 (part 1 of 2), “How Does the Concept of Culture Help Us?” (229-236). “How Language Shapes Thought” by Lera Boroditsky in Scientific American (2011). 17. Is Capitalism the Best Economic System? Richard Borshay Lee, “Eating Christmas in the Kalahari” in Natural History (1969). 18. Why Does Politics Matter? 21. Is Social Inequality Inevitable? Richard Handler, “Let’s Keep Arguing About Flags and Statues” in Sapiens (2016). Peggy Levitt, “Why We Need Transnational Social Protection for Migrants” in Sapiens (2017). 24. When Did Globalization Begin? 25. Why Does Globalization Feel New? 26. What Will Happen in the Future?